Moving on with the desert stuff, there are still a bunch of interiors to finish. 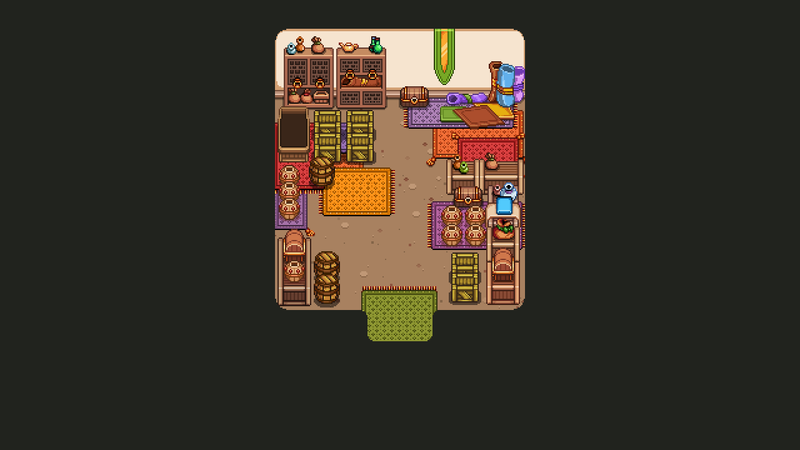 By now I've made so many random items across the game that a lot of them can be reused in various ways, and for this room in particular I used a bunch of old stuff either as is or after making some slight changes to them. This house, you see, is a warehouse that stores a ton of random objects, so what better place to reuse a bunch of those random things, such as jars, chests, boxes and whatnot? Of course, we wanted to keep the feel of the desert interiors so where's a bunch of carpets and such as well.